If we played the association game, and I said “destination wedding,” would “beach” be the first word that comes to mind? That answer would certainly serve you well as a contestant on The $10,000 Pyramid. 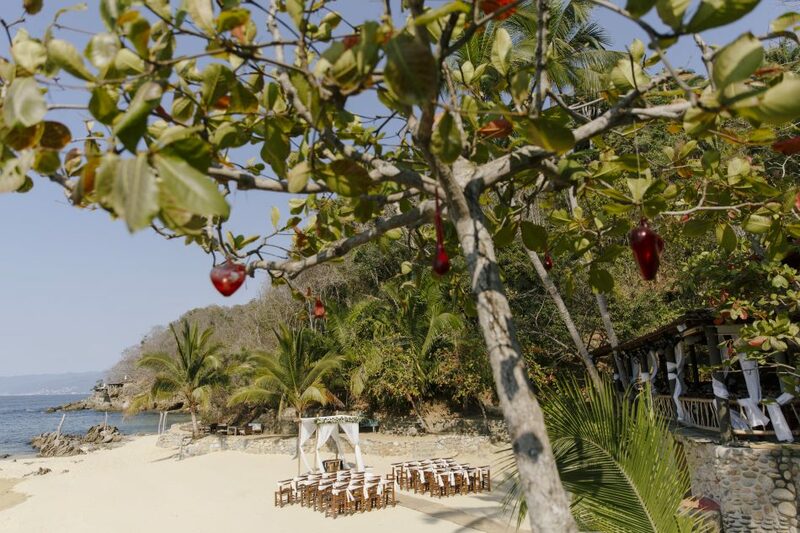 Beaches and destination weddings go hand-in-hand, but it might surprise you that not all of them are on a beach. 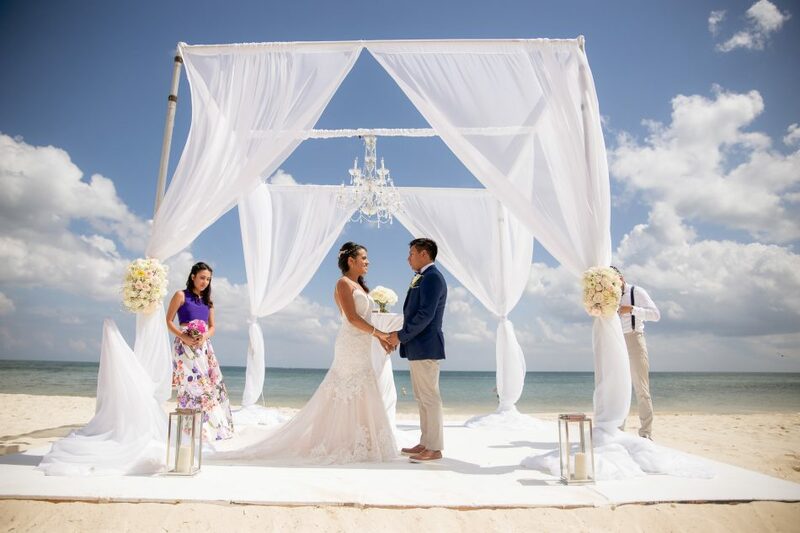 As destination weddings have become more and more popular, resorts have responded by creating unique wedding venues that complement any couple’s style. Here is a crash course for some of the venue types you can choose from for your destination wedding. See which ones fit you! You can’t go wrong with a classic. A beautiful beach is a requisite of a tropical destination. We travel for those floury sands and sweet ocean breezes (especially if you’re escaping frigid winters like we typically are). 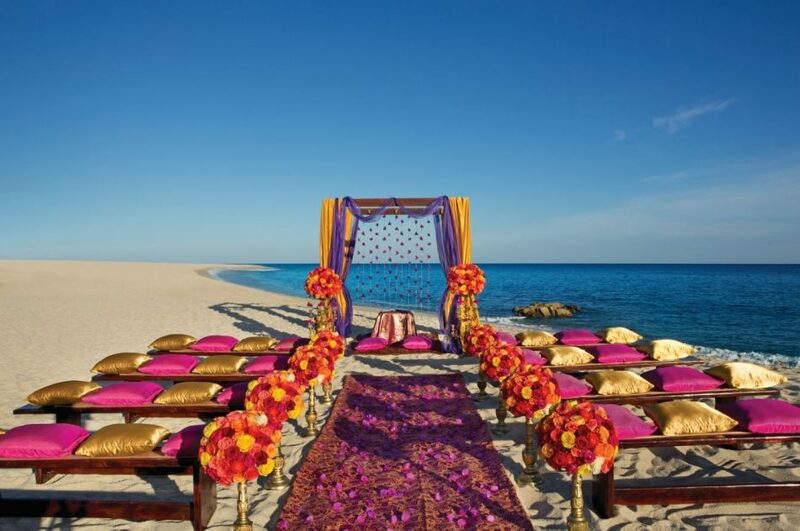 Beach ceremonies are a staple of the destination wedding if not simply because you can’t beat that view. The photography comes out stunning with bright shades of white and blue, and contrasting darker colors against the sea background makes for a great visual experience. 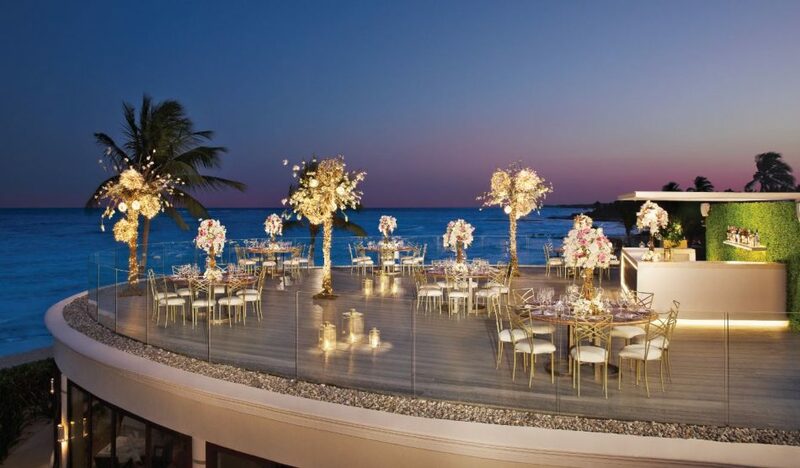 Receptions on the beach are also a ton of fun. Everyone ends up barefoot at the dance anyway, and the cool breeze off the ocean cuts through any heat. If you want an elevated beach experience, choose a resort on one of the best beaches the Caribbean has to offer, like Negril Beach, Bavaro Beach, or Maroma Beach (consistently voted in the top 10 in the world). There is nothing more serene than a garden wedding. Being surrounded by nature is so calming. 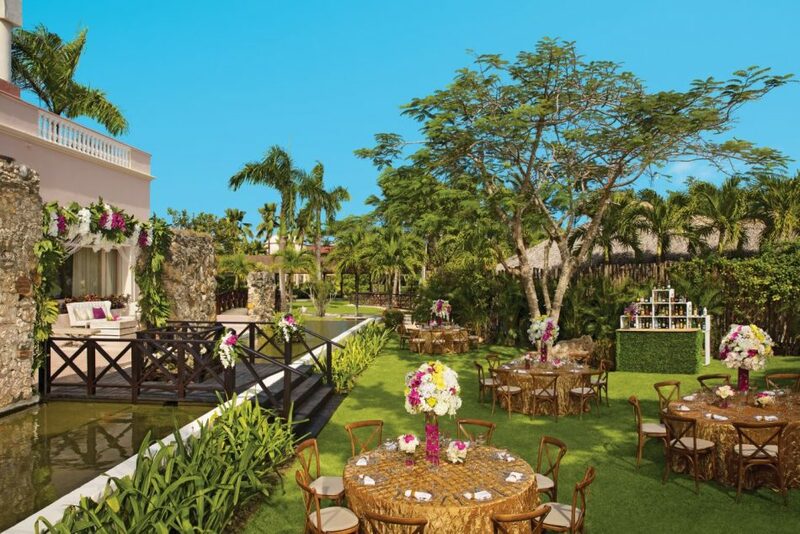 Destination garden weddings are amazing because of the lush tropical flora that serves as a whimsical background for ceremonies and receptions, especially with lights strung romantically across the garden trees. 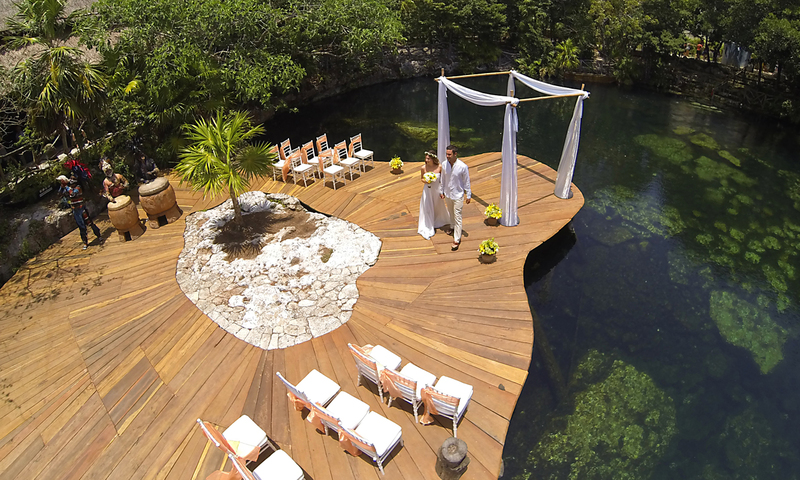 Even better, gardens are normally secluded and very private for you and your wedding guests. 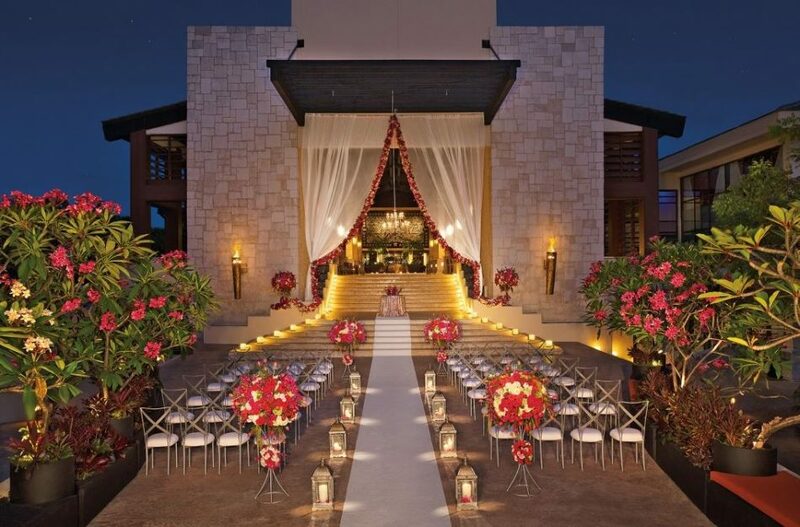 Ceremonies under gazebos and pergolas are dramatic and statement-making. Normally gazebos have views of the ocean, but sometimes they might be over the pool or in a garden. There are so many variations – stone, wood, glass – and flowers and ribbon décor enhance their already dramatic look. 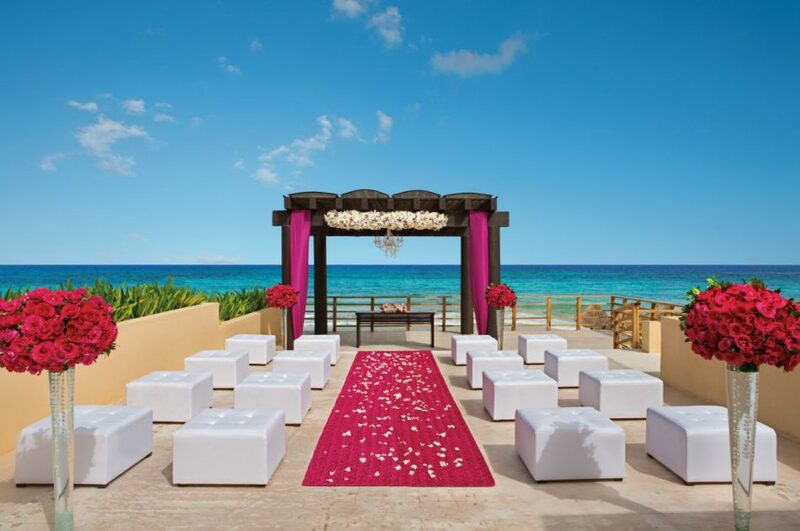 Terrace weddings, both for ceremonies and receptions, are a huge trend in destination weddings right now. There are terraces that face the ocean, terraces that are surrounded by gardens or pools, and (my favorite) terraces that are atop oceanfront roofs. 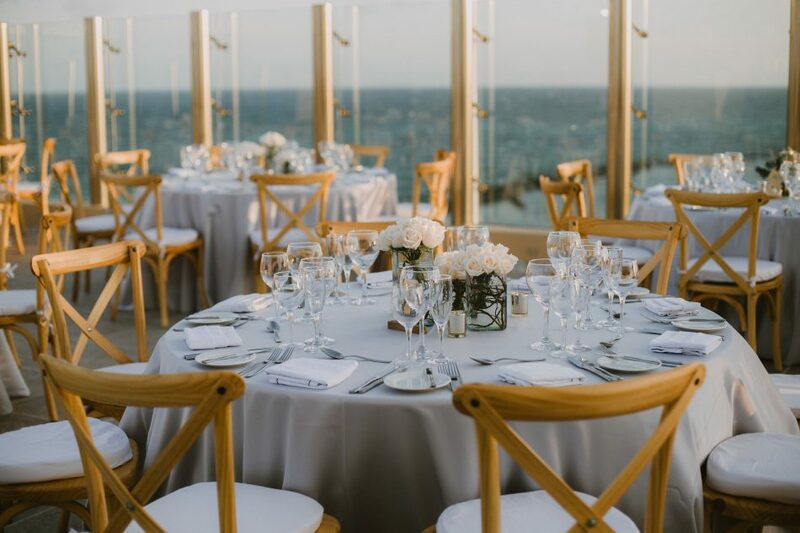 Rooftop terrace weddings are so chic and modern, hold a large number of wedding guests, and are likely a trend that is here to stay. Speaking of chic and modern, if you desire an upscale wedding, why not a private mansion? 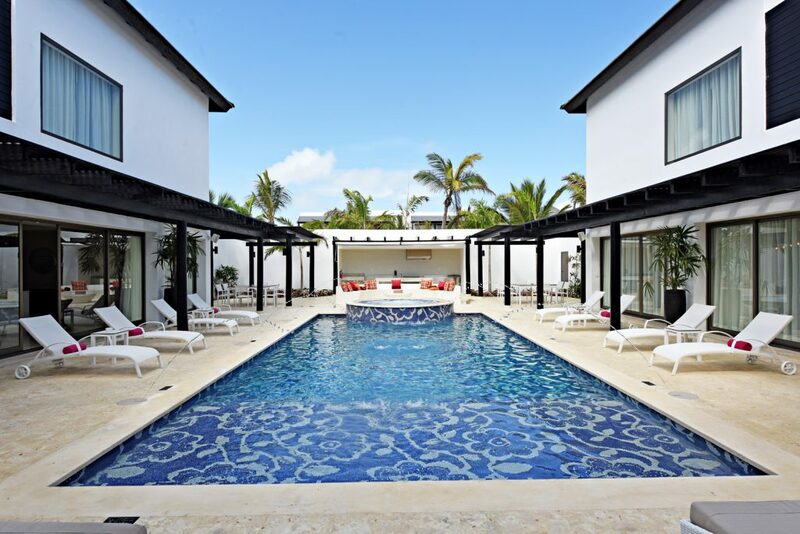 The CHIC Mansion at CHIC Punta Cana is luxury defined. This is for any bride or groom that wants to be a little bit “extra” on their wedding day. Plus you and your guests can have your stay at the mansion, which is complete with your own private pool, hot tub, butler service, and much more. Do you want the destination vacation experience, but would rather have your wedding reception be air conditioned? 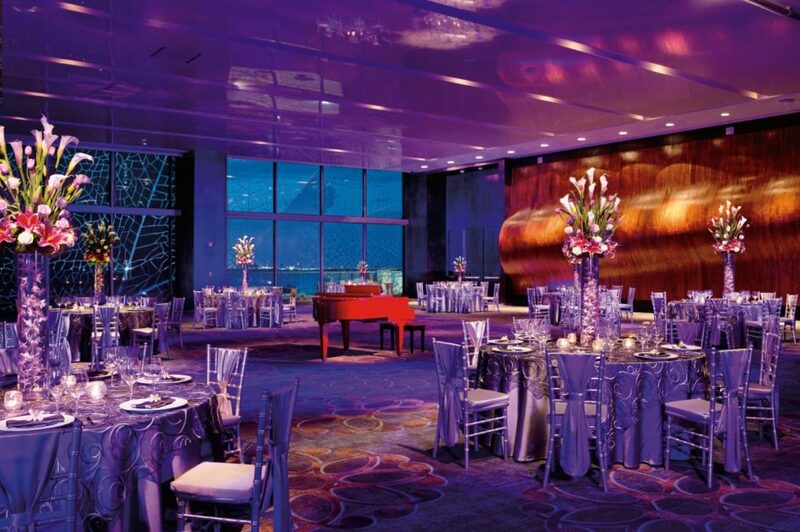 Then a ballroom wedding is perfect for you! They hold a large number of guests so you don’t have to trim that guest count, and many have gorgeous views and even breezy terraces if your guests want to get some fresh air. The best part is most resorts have one, so you have no shortage of options. 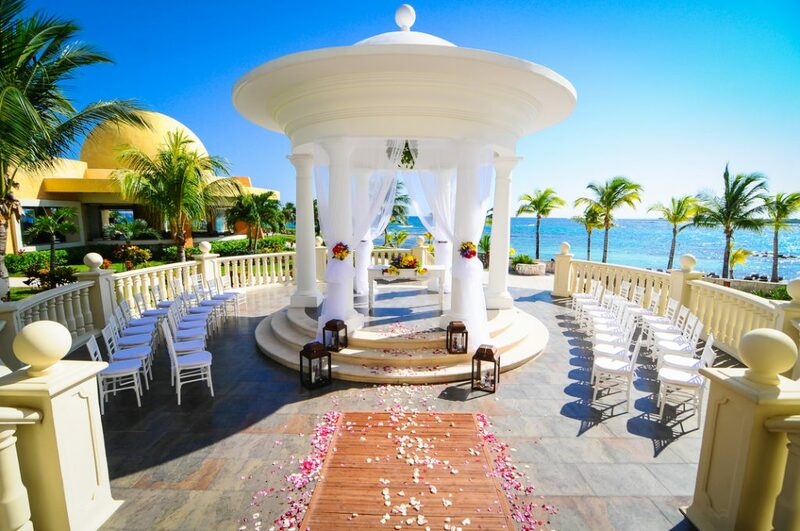 Plenty of resorts utilize their pools as a decadent ceremony space, with elaborate gazebos or platforms built over the water and often with an ocean backdrop. Depending on the time of day you plan to have your ceremony, these venues can still feel rather private for small wedding groups. 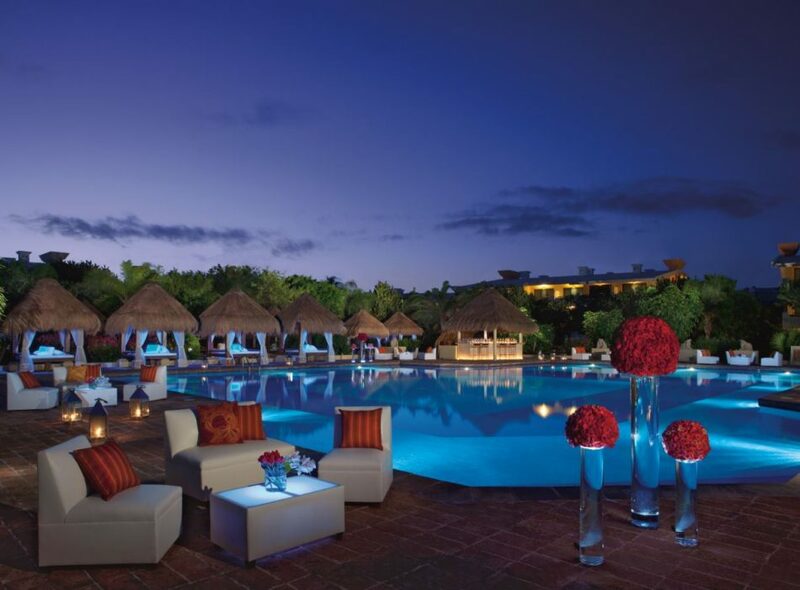 One of our favorite pool venues is the see-through platform at Secrets Playa Mujeres. 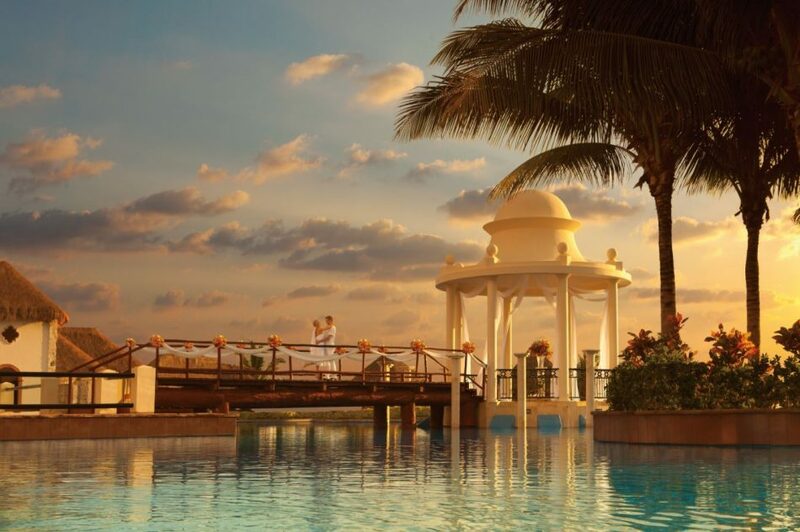 Set above the infinity pool overlooking the sea, it is a venue your guests would not soon forget. Pool decks are also excellent reception locales with the way the pool lights glimmer after sundown and add a touch of glam. If you have never seen (or swam in) a cenote, we highly suggest adding it to your bucket list. Cenotes are underground caves that that formed when bedrock collapsed and pure groundwater filled the space. They are a true natural wonder that make for a unique and unbelievably special wedding ceremony. The setting grants you some legendary wedding photos that are definitely Instagram-worthy. Destination wedding ceremonies set upon grand staircases remind us of glamorous movie moments à la Beauty and the Beast and Titanic. Adorned with flowers, lanterns, and other romantic touches, the outdoor staircases provide a gorgeous venue for your nuptials. Not to mention, all of your guests can easily see you from wherever they are sitting. 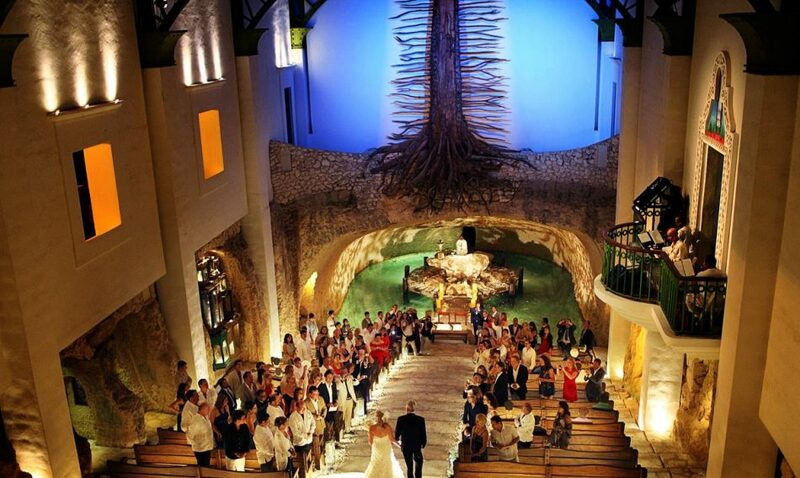 A growing trend in destination weddings is offsite venue locations. Private locations such as Las Caletas Beach Hideaway or Xcaret Park provide a fresh and exciting view for your guests and double as a fun excursion from the resort.